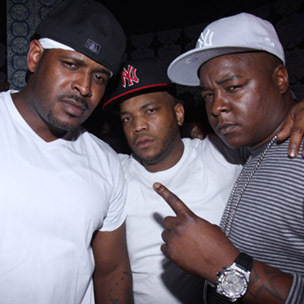 The wait for a studio album from the Yonkers, New York rap trio known as The Lox may soon come to an end. While speaking exclusively with XXLMag.com, Sheek Louch and Styles P spoke briefly on the album, tentatively titled We Are The Streets 2. Sheek Louch joked about the album being a myth, but did reveal that it will be released next year. Styles P then announced that solo albums from those in the group can also be expected. “What fans should expect is a full length LOX album and three solo albums,” Styles P added. Earlier this year, it was revealed that a tour featuring G-Unit, Dipset, and The Lox was possibly in the works. News of a possible tour was then confirmed in September of this year when Sheek Louch replied, “I think Kiss and 50 is putting that together right now,” after being asked about the tour. The rapper again provided an update on the tour during the group’s interview with XXLMag.com and revealed that a tour may kick off in May of next year. “It’s the 50 Cent Tour he’s trying to put together. It’s supposed to be, I think, in May is when they trying to get it going, some time next year. I mean we’ll do it, I’m with it,” Louch said. Lastly, Styles P offered his thoughts on the current Hip Hop scene. According to the rapper, in order to find “good music,” one must look outside of the mainstream and what’s being played on the radio.